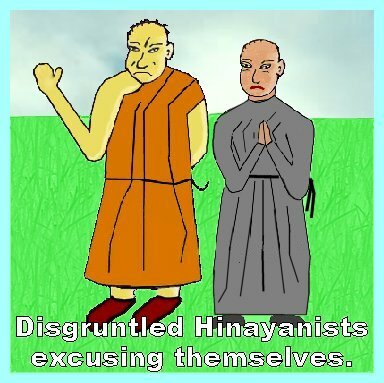 As evidenced by the scarce information under "Origin" on the previous page, the detailed history of how Mahayana arose and grew as a religious movement is not well known. There are many writings along a more philosophical line that we can use to to trace the conceptual development of Mahayana thought, but for the moment, those go beyond the intent of our discussion. We shall briefly look at some of them further on, towards the end of this larger section on Mahayana. One thing, however, is clear: From the outset Mahayana Buddhism never came with a single set of beliefs or practices. There were disagreements, and various commentators wrote down their particular approaches in books and pamphlets. Furthermore, new sutras came on the scene as well. They were clearly not in accord with the Pali canon, the Tripitaka. Nonetheless, they claimed to be a record of the Buddha's own teachings. Imitating the style traditionally ascribed to Ananda with regard to the Pali sutras, they, too began with the assertion: "Thus I have heard." I need to take a step back here and make an important point so that one can see what follows in the correct light. Buddhism, like Christianity, is a missionary religion. Some Buddhists, trying to conform to contemporary political correctness, may have spread the idea that it is not a part of the nature of Buddhism to seek to convert anyone, but that notion is not only wrong, it is contrary to the nature of this religion. Its very beginnings stress the idea of Buddhist outreach. For example, some versions of the account of Buddha's time underneath the Bodhi tree, credit the Hindu god Brahma (recognized iconographically by his four faces), with persuading the newly-enlightened Buddha to go out and preach the dharma so that many people would find the way of release from suffering. And that attitude has always been a part of Buddhism. King Ashoka himself sent out missionaries to Kashmir and Sri Lanka. "Conversion" does not have to mean "conversion by force." 2 The point is, then, that Buddhism, particularly in the form of the newer Mahayana versions, was spreading as various individuals visited new countries and taught their new faith. One country that stood out as the destination of many Buddhist missionaries was China. The religious history of China has never been anything but complex, and Mahayana Buddhism, with its supernatural Buddhas and Bodhisattvas, filled a need. (It is commonly accepted that religious Daoism developed its formal pantheon of gods in reaction to Buddhism). So, when Buddhism came to China, Chinese culture was ready to accommodate it, but not without leaving its own unique stamp on the religion. 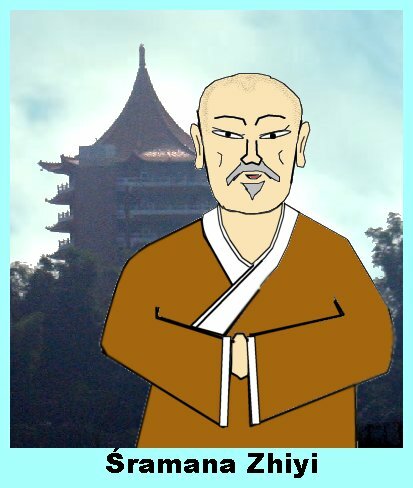 A problem that a number of newly-converted Buddhists in China encountered, however, was the aforementioned one that Mahayana Buddhism did not come with a single, consistent belief system or with dogmatic philosophical principles. Many new Buddhists in China, who were intent on studying the various Buddhist writings found that they could not reconcile all of the scriptures and commentaries. Zhiyi subscribed to the concept, which we will explore in more detail a little later, that the world is caused (as in "dependent origination"), but is also ultimately Sunyata, which means "emptiness" or "pure nothing." Consequently, he advocated a doctrine that includes a slight switch of emphasis from Theravada teaching. In the older, more traditional, school, the way to enlightenment led to the realization of non-self (anataman) along with the impermanence of the universe. For Zhiyi and other Mahayana leaders, non-existence did not stop with the self, but included everything, and thus, the realization creating enlightenment is that all is Sunyata. Thus, in his view, the acceptance of nothingness and enlightenment were actually synonymous, and together they constituted Nirvana. In other words, he instructed his followers not to think of Nirvana as some place, whether in our time and dimensions or anywhere else, but as the complete divorce of the mind from all time and space. So, all things share the same nature of being caused, while ultimately consisting of nothing. Then there is no distinction between the flea, the human, the demon, or the Buddha. When you come right down to it, they are each exactly what the other one is, and, thus, they can all become Buddhas. What confuses many a casual student of Buddhism is why, if the Mahayana chronology is true, the Buddha should have taught the difficult message first and reserved the easier and far more attractive teaching for later. At first he required people to become bikhus and to work up from there to becoming arhats, which only a few people could achieve. Then later, he preached that full Buddhahood was available, and that anyone could attain it. Why the earlier disinformation? The Lotus Sutra gives us a clear answer to the question: The people were unwilling or unable to hear the true message, and so the Buddha taught several ways to enlightenment in order to get their attention. In reality, however, there is only one way, and it is the third of the three ways mentioned above. There is a principle behind this approach to teaching. In Sanskrit it is called upayana, and it means "skillful means." The next page has a more extensive discussion of it. 38. Remarking this slight, went, defective in training and foolish as they were, away in order to beware of damage. 39. The Lord, who knew them to be the dregs of the congregation, exclaimed: They have no sufficient merit to hear this law. 40. My congregation is now pure, freed from chaff; the trash is removed and the pith only remains. 41. Hear from me, S�riputra, how this law has been discovered by the highest man, and how the mighty Buddhas are preaching it with many hundred proofs of skilfulness. Thus, even though some of the differences between the teachings of early Mahayana and Theravada seem to be slight to the outsider, their respective adherents took them to be very important. As illustrated in the Lotus Sutra, Zhiyi and others did not just see Mahayana as an expansion of the tenets of the earlier Hinayana schools. They believed that their understanding of Buddhism had replaced those arhat-centered versions. The Tiantai school thrived in China and eventually became important in Japan as well, were it was known as Tendai. By that time, however, the relatively straightforward teachings of Zhiyi had picked up a number of the magical and occult practices derived from Tibetan Buddhism, and it was reckoned among the "esoteric" schools. 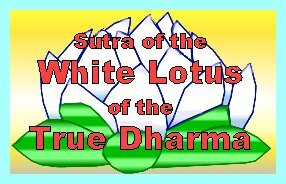 1There are two translations of the Lotus Sutra in common use today. A rather modern one is Burton Watson, transl., The Lotus Sutra (New York: Columbia University, 1993). Watson's translated from a Chinese version under the auspices of Soka Gakkai International. The other one is very diferent in many aspects, but, because of its easy availability and the ability to link to it directly, most of the references in this section will be to it. It is the venerable translation in the Sacred Books of the East, vol. 21. H. Kern, transl., Saddharma Pundarika or The Lotus of the True Law (London: Oxford, 1884). This version, like all 50 volumes of the Sacred Books of the East, edited by Max M�ller, is available at the Internet Sacred Text Archive. Kern translated from an ancient Sanskrit version. There are other points of distinction of which we should be aware. Kern uses a form of Romanization for the names of Buddhas and Bodhisattvas that is no longer in use. One of the biggest differences is his use of a soft "G," where nowadays one would transliterate the character with a "J." For example, he spelled the name of the Boddhisattva Manjushri as "Mangushri," and also availed himself of diacritical marks. Sanskrit has a number of characters for the sounds "S" and "Sh." Kern follows a method of distinguishing them with standard markers. I cannot account for Watson's use of "Sh" in numerous instances, such as the name "Shariputra," which, in Sanskrit or Pali would have begun with an "S."
In fact, Watson only transliterates the names of the best-known Buddhas and Bodhisattvas; for most of the others he provides an English meaning of their names. There is nothing wrong with this practice, but one must be aware that he treats names inconsistently. Among the epithets of the Buddha, where Watson says "World-Honored-One," Kern simply uses the word "Lord." The Sanskrit word Tathagata refers to a Buddha. Kern leaves it untranslated. The first half of the word seems to be derived from tatha, which means "thus" in the sense of directing someone to a location. Watson translates it (basing himself of a Chinses version, of course) as a "Thus Come One." I believe that a more widely accepted meaning includes the idea of the Buddha being the one who shows the way to go. Watson translates numbers into standard American usage. Kern retains the Indian way of stating large numbers. A frequently recurring term is koti, nowadays known as crores, which is equivalent to "ten million." Thus, in one representative place, Kern's "30 thousand koti" of Buddhas stand for Watson's "30 billion." 2Unfortunately, just to make sure that we close the door on anyone using misinformation as a weapon in lively debates on religion, Buddhists, just as adherents of most other religions, also deviated from the ideal and shed blood, both on behalf of Buddhism per se and to promote particular schools of Buddhism. Back to text.